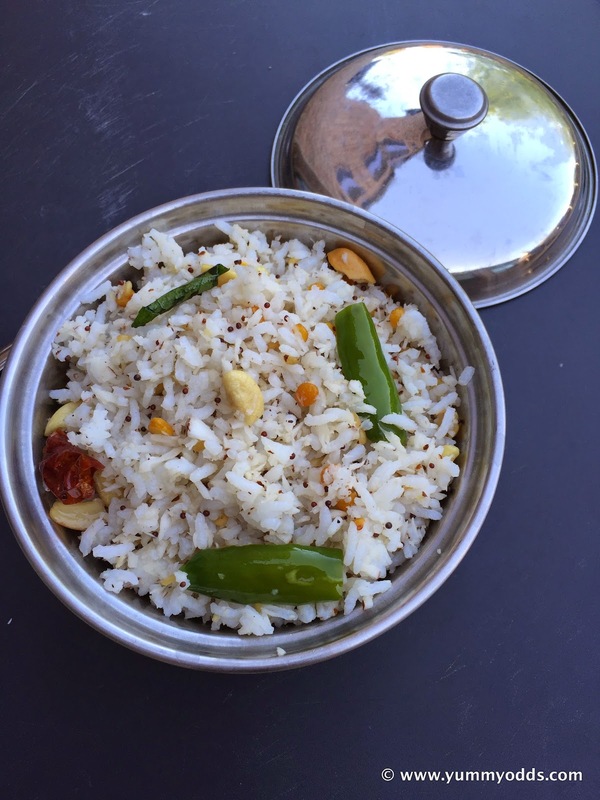 This Coconut Rice is so simple to make and delicious rice recipe. As there is no ginger, garlic or onion used in this recipe this can be considered as Saatvik Rice and can be served during Festive or Puja Times. When you have left over rice you can transfer into this yummy Coconut Rice in minutes ( to get a break from your routine Pulihora) and you can pack this for Kids (or your) Lunch Box as this is very mild and kids can handle the spice in this rice very well, it makes the Lunch Box little fun and special. This rice is sautéed with Indian tempering ingredients, curry leaves, green chilies and coated with cashews for additional crunch and topped with Ghee for nice flavor. Here is the recipe, Njoy! First Grate the Coconut from the shell. If you don't have the grater,chop the coconut into pieces and grind it in small jar mixie coarsely. Heat the non-stick pan, add 1 Tbsp Oil and Ghee to it. Once the ghee melts start adding tempering ingredients in order of Dry Red Chili, Chana Dal, Urad Dal sautee for 2 min until lentils turns to golden color. Ad mustard seeds, followed by curry leaves and green chilies. Sautee for 2 more min. Now add Chopped Cashew Nurts to the tempering, saute them until Cashew nuts are fried to golden color. Add 2 cups of cooked rice to the pan and mix it well with tempering. Add 1 tsp of salt to the rice and mix it. Add Grated coconut to the pan and mix everything until well combined quickly. Don't cook too much after adding coconut, as it spoils the fresh coconut taste. Switch off the Stove and transfer the rice to Serving Bowl and serve warm or pack in Lunch Box! Ture Remya, This is a nice transition from routine Fried Rice and Pulihora, when ever i have left over rice!